We have operated Crazy About Loons Photo Tours for seven years now. We sell out every year because we have built up a base of happy customers who both, return for repeat trips and recommend us to their friends. Our successful approach has been to cater to small groups or individuals and to try and be flexible enough to adapt each trip to best suit both the customer and the current conditions. 2018 and we are starting our second season offering cowboy and western photo tours. We continue to use the same principles that we have built our photo tour business on, as we expand into offering cowboy/western photo tours and workshops. I have secured exclusive access to a large working cattle ranch. We will have the opportunity to shoot actual working cowboys as well as having access to thousands of acres of beautiful grassland scenery and heritage buildings. Mike and Natalie Anfield will be your hosts, click here for more information on them. What will we be shooting? 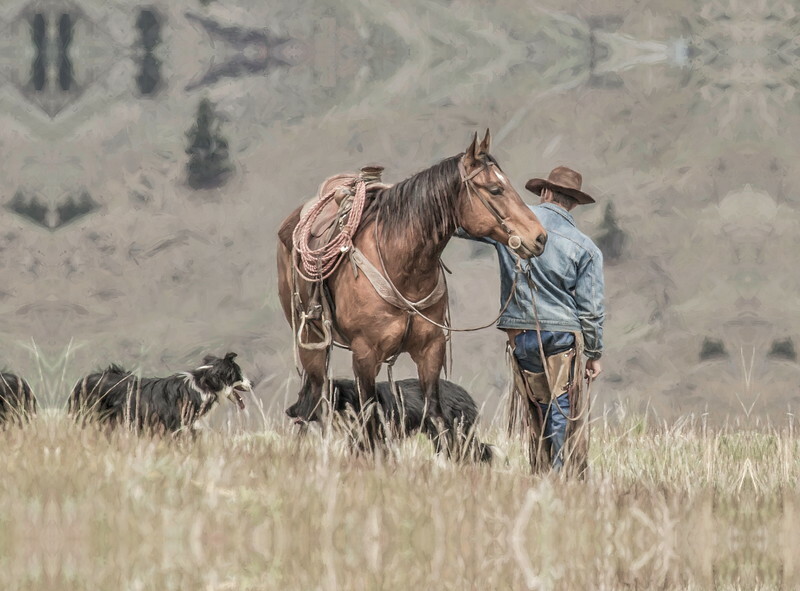 We will have a great variety of photo subjects, one of the highlights will be the chance to shoot actual working cowboys as they work cattle on horseback. We will get around in a six seater side by side . This will allow us to get out to where the cowboys are working (without saddling up). As well we can explore the vast grasslands and shoot the beautiful scenery. We will also have opportunities to shoot posed shots of cowboys and their horses in some beautiful surroundings. On location and back at our home ranch we will have time to shoot some of the gear, saddles boots spurs and the other iconic symbols of the western lifestyle. Another feature of our trips will the chance to shoot some of the old barns, corrals and homesteads erected by the original settlers of the area. Workshops: Workshops will be multi-day and consist of a group of 4 or 5 photographers. The focus will be on getting you great photo opportunities more than on teaching you to how to take pictures. Instruction and assistance will be provided for those that desire it. We are experienced instructors so the workshop will be suitable for all level of photographers. We will spend a little classroom time talking about areas unique to this type of photography but we want to be outside taking pictures as much as possible. We will have coordinated with one of the ranches to ensure you have the chance to shoot working cowboys moving or tending to cattle. We will also be able to do more structured shots taking advantage of the dramatic scenery of the grasslands. On our home ranch we will have access to our barn which has great natural light as well as available studio lighting for a session of still life shooting, capturing the iconic symbols of the western/cowboy lifestyle. Check here for currently scheduled workshops. We will also be offering day tours that can be booked based on our availability. You will have your own guide and exclusive access to thousands of acres of ranch land. Cost will be $45 an hour for a minimum of 4 hours. You can add up to 3 more friends at an additional $5 per hour per person. As stated you can come as a group of up to 4 but I will not combine individuals or groups. This ensures we can spend our time shooting what interests you the most. If you aren’t that interested in cowboys but would like to spend a morning or afternoon shooting heritage buildings we could do that or just landscape or… well you get the point. There isn’t a cattle drive or round up everyday but we can and will get you the opportunity to shoot cowboys, horses and cattle if that is your interest. Day tours can be booked anytime but will be based on availability which will be limited.